(b. 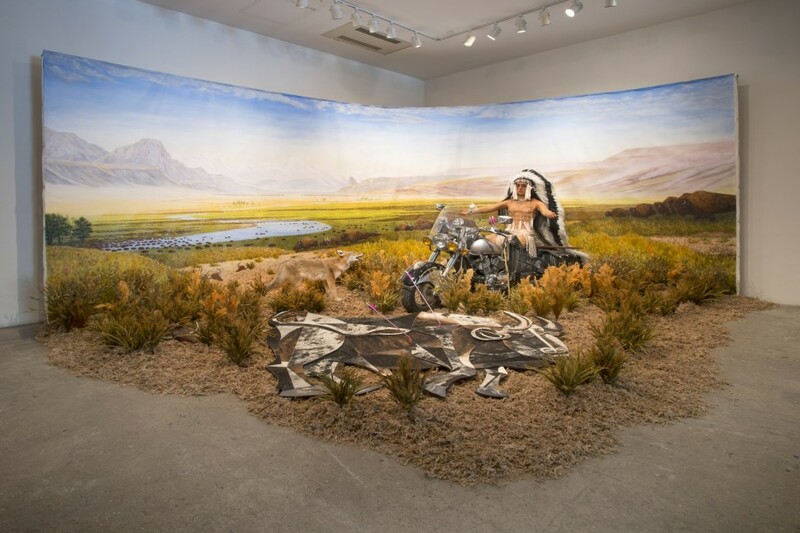 1965, St. Mary’s, Ontario, Canada; Lives and works in Toronto) Kent Monkman challenges the historical record, prying open what we thought was truth. 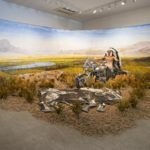 Through his alter ego, Miss Chief, Monkman takes us back to the time when perceptions of “the Native” were formed, in an effort to upend the subservience of so-called primitive art in the development of modernism. The North American plains comprise the hand-painted backdrop of this diorama and the bull in the foreground, fatally pierced by Miss Chief’s pink arrows, alludes to Pablo Picasso’s Guernica of 1937. Piercing both the birth of modernism and the birth of the natural sciences with the same irony-dipped arrow, Miss Chief also shoots dead the myth of the vanishing Indian.